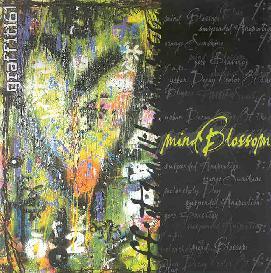 Lasting just over 45 minutes, Mind Blossom by Graffiti 61 is a total exploration of sound textures. It reels in ambient atmospheres, it flows with a solid engine behind each rhythm, and it treads through the emotions of its creator, Dominic Massaro, with vivid clarity. Massaro is a southern California based musician who has entertained countless audiences in the L.A. area over recent years. His style and sound lies in the realms of synth induced tapestries, merging laid back grooves with keyboard pads and the occasional guitar based structure. From the first offering, "Mind Blossom" to the last track "Zero Gravity", Massaro has made this album flow without too much straying from his desired feel. All tracks are very emotion building; they offer Floydish vibes mixed with newer generation stuff like Saturnia, and Discolor. Graffiti 61 seems to evolve mellow dream ambience that would be perfect for the Future Sound of London buff. The beats that Massaro uses are not overpowering. They come and go leaving vast spaces for Tange/Floyd moments. These moments are worked well. The Floyd influence comes out in many tracks, but it is very different, it is subtly worked. The first track "Mind Blossom" stirs an almost "Heart Beat Pig Meat" feel and to me some interesting stuff is brewed. While "Orange Sunshine" is almost like the build up on "Careful with that Axe Eugene". Throughout this album, the vibes are washed with space, but it is Massaro’s style of space, and that is what makes Graffiti 61 stand out among other bands doing similar stuff. I have listened to Mind Blossom a few times and am doing so as I write this. It is an old style done in a new way and I will listen to it more I’m sure. I think that Graffiti 61 would be an interesting live act to catch so if you live in the L.A. area watch out for the name.